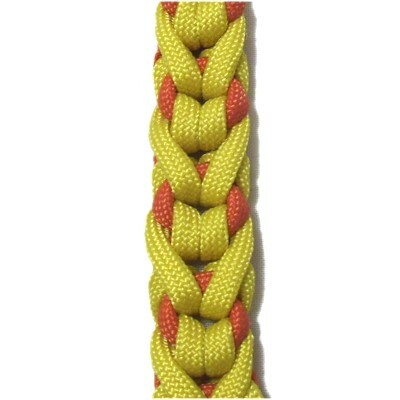 Description: The Stitched Monkey Bar is a unique variation of the Oat Spike design. It's also related to Endless Falls. 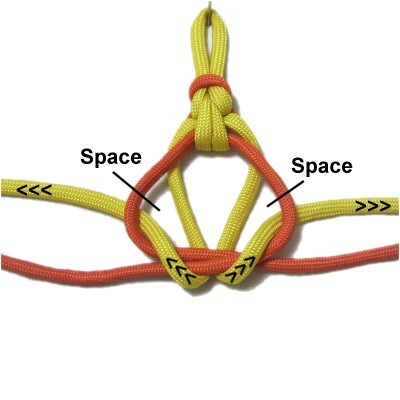 This decorative knot pattern is formed by alternating from front to back each time you tie a new knot. The loop at the top is optional, but is the best way to start the bar if you need a clasp for a bracelet or belt. 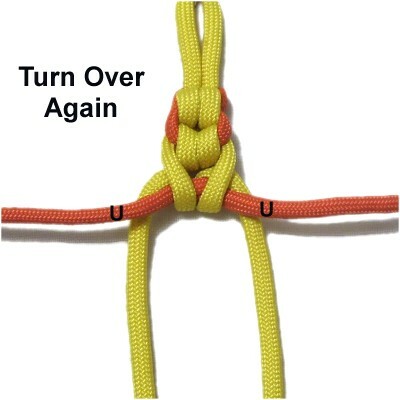 This design was found on the Fusion Knots website. 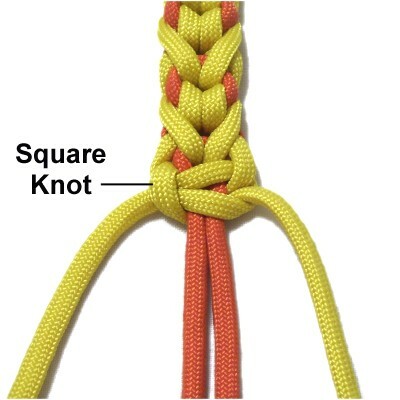 The video gallery contains tutorials for many interesting combination knots. 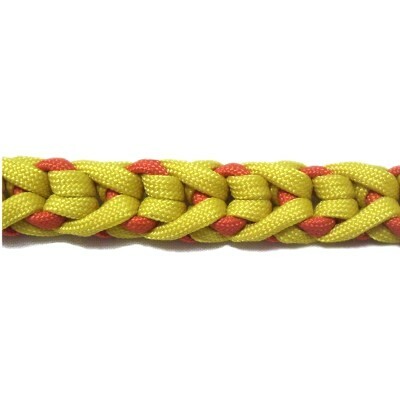 To practice the Stitched Monkey Bar, you need two cords (different colors), each at least 45 inches long. When using this technique for a project, multiply the finished length by 10, and cut the working cord to that length. 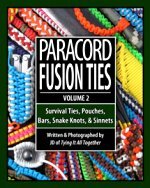 The holding cord should be at least 36 inches long if you intend to make a button knot to form a clasp. 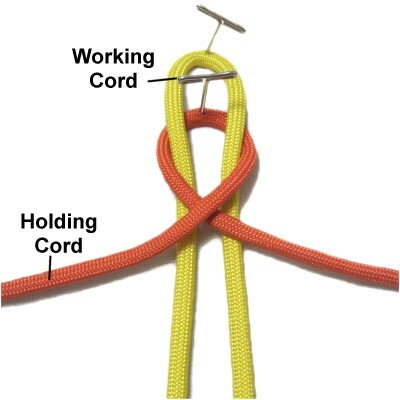 In the example shown, the working cord is yellow and the holding cord is orange. Step 1: Fold the working cord in half and secure it to your board in the center. Place the holding cord under it and secure it in the center, too. 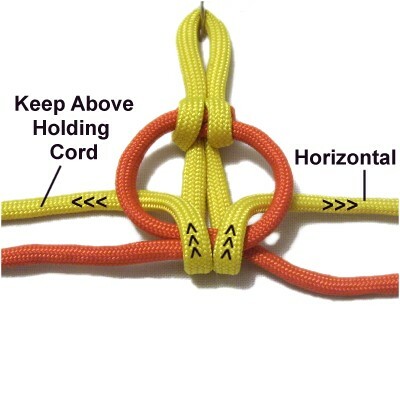 Bring both halves of the holding cord on top of the working cord, and cross them right over left. Move both halves of the working cord backward, over the crossed area of the holding cord. Pass them through the area between the two halves of the working cord. Move them under the crossed area of the holding cord as you pull them toward you. To tighten the knot, pull both halves of the holding cord first, followed by the working cord. Adjust the size of the loop to 3/4 inches if you plan to make a button knot at the other end (for a clasp). Step 2: Move the holding cord on top of the working cord and cross the two halves right over left. This image shows the spaces where the two halves of the working cord will go in the next step. Move each half of the working cord backward, over the crossed area of the holding cord, then through the space indicated in the previous image. Pull them to the right and left horizontally, so they remain above the holding cord. 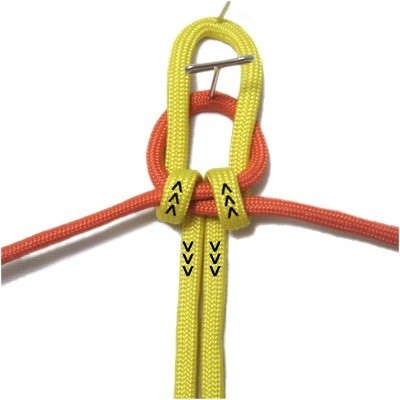 Step 2, continued: Tighten the second knot by pulling on both halves of the holding cord first, followed by the working cord. Make sure you tighten firmly, so the cords are balanced. 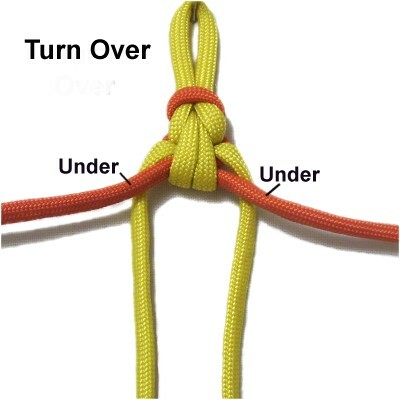 Step 3: Turn the entire knot over. Pass the working cord under the holding cord on each side. Remember that each half of the working cord passes through the spaces furthest to the left or right, NOT the one in the center. Arrange the working cord horizontally, resting above the holding cord. Step 7: Repeat steps 3 and 4 several more times, until the Stitched Monkey Bar is the size you wish to make. 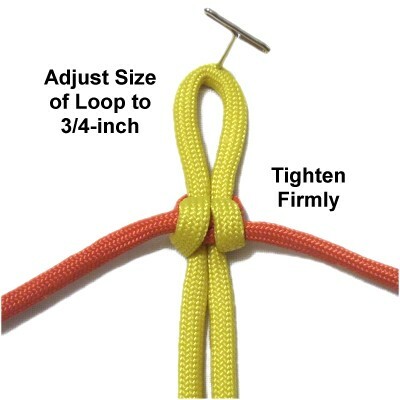 Make sure you turn the sennit over each time you start a new knot. 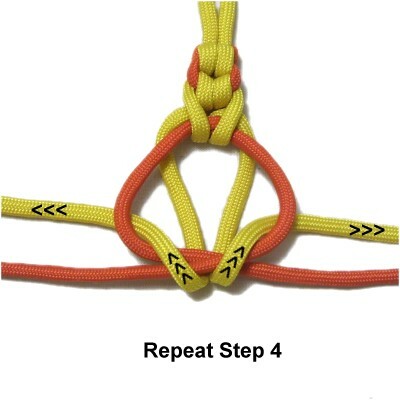 Step 8: To finish, tie a tight Square Knot using the working cord. 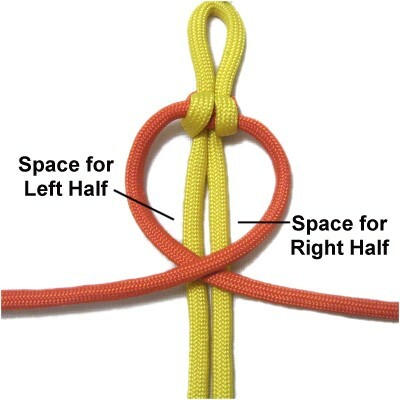 This is optional if you wish to use a different knot. You can now finish off the ends of the working cord by sliding them under loops in the BACK of the sennit. Step 9: You can now make a button knot using both halves of the holding cord, if you need a clasp. 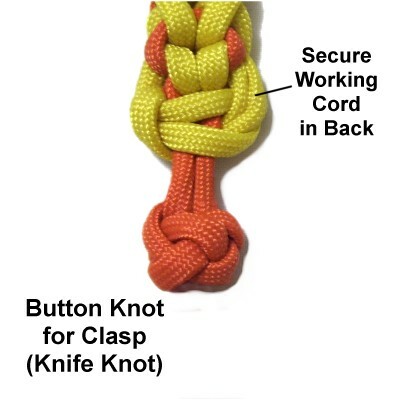 The Knife Knot, also called the Diamond Knot, is the best option for this design. Cut off the ends of the holding cord after the knot is tightened firmly. Have any comments about the Stitched Monkey Bar? Contact Me.